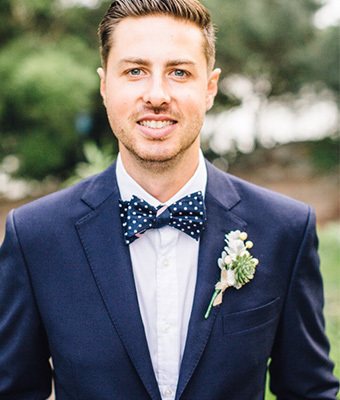 This guest post comes to us from a dear friend and style blogger, Blake Hammerton of The Sharp Gentleman. Blake writes about menswear, style, relationships, character, and what it means to become the man you were born to be. 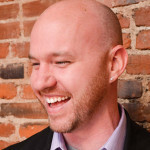 He’s also in Dallas and works with local clients interested in style, character, and confidence. Learn more about The Sharp Gentleman at his site and his Instagram. A wedding is a big deal. It’s a dance of a million different pieces all trying to make sure the rhythm is perfect and nobody falls out of step. Said another way, a wedding is a stress explosion. What we have in our heads and what actually transpires can often be two very different things. To help alleviate some of that stress, the groom and groomsmen can make sure they have their style game set to win. When the bride is trying to balance everything (whether she actually needs to or not, we all know she’s still trying to), hearing that the groom can’t find his shoes, or that his tie is wrong, or that the tuxedo jacket doesn’t fit will cause undue damage to an already overwhelmed bride. Get it together, grooms! 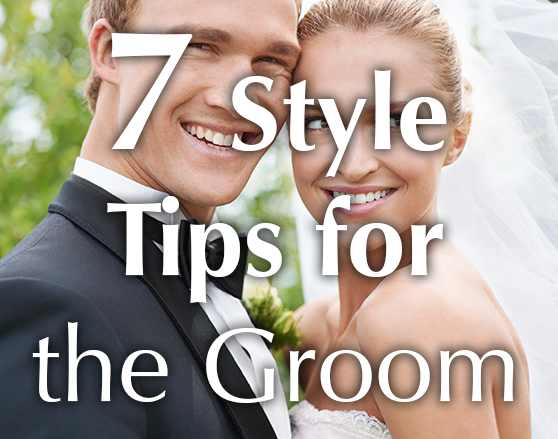 Here are 7 easy style tips for the groom so he looks his absolute best for the Big Day. No matter what your colors are, they will look amazing when his clothes fit correctly, and unflattering when they don’t. He can get away with almost anything when his suit is tailored to fit his body. One item to consider is his dress shirt. He’s going to take his jacket off at some point in the evening, and if his shirt is wrinkles or extra fabric sticking out everywhere, neither of you will be happy with it. Spend a little extra money and get him a custom-fitted dress shirt so it fits his body like it was made for him… because it was. A suit, jacket, shirt, and/or trousers that are tailored to his body will always make him look slimmer, leaner, and more put-together. One way to make sure his style is on point is to add in the details that are often overlooked: pocket square, cufflinks, watch, and tie bar/clip. One man in a black suit doesn’t hold a candle to another man in a similar suit but outfitted with cufflinks and tie bar that match, a pocket square folded perfectly, and a watch that tells the room what kind of style he likes. The details make all the difference to you, right? They also matter to him… or at least they should. When putting together his suit or tuxedo for the wedding, explore the additional pieces that will make it perfect. If you need help, don’t hesitate to contact me – I’d love to help. Most couples venture into the “we’re dieting for the wedding” lifestyle so they can get those bodies into picture worthy shape for the big day. One avenue that is often overlooked is the groom’s wardrobe. You can almost instantly make him look leaner and lighter by putting his trousers and shirts on a diet. Remove excess fabric and unnecessary folds and tucks. What you’re left with is a suit that he wears like an extension of himself – confident, sleek, debonaire. 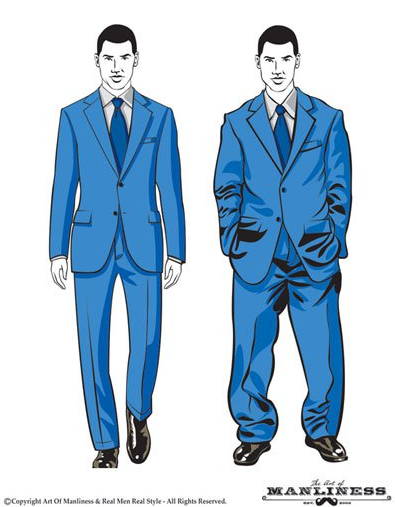 We’ve all been to a wedding where the groom comes out wearing a suit that’s built like a box, while one of his groomsmen (with the same build) has a slim, tailored suit. The groomsman looks dapper while the groom looks dumpy. Don’t be that groom. They need to be worn in, but not worn out. Most dress shoes are comfortable after a week of wear. You want them to look great, but also not be stiff and uncomfortable. Purchase your shoes at least two weeks before the big day and wear them for a week to break them in. They need to be polished if black. The groom’s shoes should look Army-ready (meaning, they’re shined up and ready for inspection). All the groomsmen should have matching shoe colors and styles. They don’t necessarily need to be identical, but if they’re all wearing the same color suit, they should have similarly matching shoes (in both color and condition). I’m a big fan of the bow tie, personally, but I know it’s not for everyone. I also feel that when selecting the bow tie option, it should be a hand-tied version. Clip-on bow ties from the tux rental joint aren’t nearly as cool as a hand-tied bow tie. When selecting a bow tie or regular tie, opt for narrow versions of each. Some bow ties are so think, they look almost comical under his chin. The same goes for traditional neck ties: narrow is best. Wide ties bring back memories of the 1980s when everything was two-tone, striped, and wide as a truck. A narrow tie in the color or pattern of your theme will look slick, modern, and proportionate. Brides begin dress shopping almost inappropriately early on, but grooms wait until the week of the wedding to get their gear in check. This is a huge mistake. Your groom should have his first fitting around 90 days before the big day. This gives him plenty of time to make sure the fit, finish, fabric, and tailoring is perfect. When you start early, you’ll save money in alterations because nothing has to be rushed (incurring additional costs), and the stress level remains very low. It’s always better when the groom has his suit/tuxedo fitted perfectly and has all the corresponding accessories at the ready. Nobody needs to rush around trying to fix a mistake, and you know it will fit beautifully. The last style tip may actually be the most important because it fits into every category of wedding, from country to cathedral; beach-front to back yard. Make sure your groom has his manscaping in check. I’m talking about his facial hair, his neckline, his teeth, his nails. You’re going to be in a lot of pictures, and you don’t want to look at them and think, man, I wish my teeth were whiter and I shaved better before that day. Think of all the different pictures you’re going to take: the smiles; pictures of your hands and rings; speeches; cake ceremony… you want to look your best, right? Begin your hygiene regiment now. Your teeth can be visibly whiter in just a few weeks. Manicures are cheap. Man up. You can do this. If you’re in the Dallas-Fort Worth area, feel free to reach out to me. I can help him get fitted with custom-tailored menswear, the right style and finishing touches, help him write his vows, and I can even officiate if needed. The wedding is traditionally her big day but it’s truly more than that: it’s their big day. He wants to be a badass groom just as much as she wants to be the most beautiful bride. With the right attention to detail, both can get what they want and live happily ever after.